If you love me, Shut It Down! 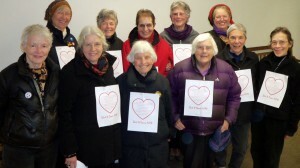 Lending heart to the campaign to end nuclear power forever, the nine women of the Shut It Down Affinity Group brought a Shut It Down Valentine on Monday to the headquarters of Entergy Corporation, which operates the Vermont Yankee nuclear power plant in Vernon. Each wearing a Shut It Down Valentine for Entergy, the death-masked women processed for about twenty minutes in a silent circle in Entergy’s driveway. Every several seconds, one of the women struck a small gong to signify the death knell for Entergy, the Vermont Yankee nuclear power plant, and nuclear power everywhere. Brattleboro police officers summoned by the Windham County sheriff and Entergy officials arrested the women one by one for unlawful trespass. They were transported to the Brattleboro Police Department where they were booked and each scheduled to appear at 8 a.m. March 27 in Windham County Superior Court to answer the charges. Upon their release from jail, the women distributed their Valentines throughout the Brattleboro business district where, they said, most people enthusiastically received them and their Shut It Down Now message. Those arrested include, from Vermont, Nina Swaim, 73, of Sharon; Martha Hennesey, 63, of Wethersfield; Robin Lloyd, 72, of Burlington; from Massachusetts, Susan Lantz, 68, Connie Harvard, 64, and Frances Crowe, 92, of Northampton; Anneke Corbett of Florence; Hattie Nestel, 73, and Marcia Gagliardi, 64, of Athol. Support for the women were, from Vermont, Deb Reger of Corinth and, from Massachusetts, Mary-Ann Palmieri of New Salem and Ruth Hooke of Northampton. “In this week of the Valentine,” reads the Valentine for Entergy, “we come to uphold all that is life and love in the beautiful hills of Vermont, Massachusetts, and New Hampshire. We sound the death knell for Vermont Yankee and Entergy.